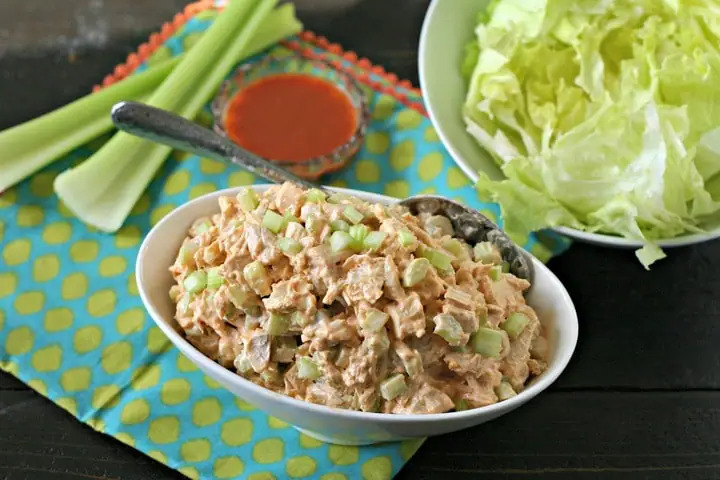 This quick and EASY homemade Buffalo Chicken Salad uses rotisserie chicken to save time! Naturally Low Carb, Keto, Paleo, Gluten Free, Dairy Free and Whole30 compatible (just use compliant mayo!). Serve as lettuce wraps, on top of a salad or even as a sandwich! Either way, it’s dinner on the table in 20 minutes! If you are anything like me, you love all things Buffalo. Buffalo wings, buffalo sauce, buffalo aioli, buffalo fries (if you have never had those, you NEEEED to get on it), buffalo shrimp. And, in our house – we even eat buffalo mixed nuts. It never gets boring – buffalo sauce flavor goes with everything! Like this Buffalo Chicken Salad. It’s easy. Like, crazy easy. Hello, we are talking 4 ingredients. FOUR! One of the ways I save even more time is to make the Homemade Mayo ahead of time (up to three days). Also, if you live near a Whole Foods Market, they have high quality organic rotisserie chickens for $10. I usually buy the “Perfectly Plain” since I don’t want any seed oils or other seasonings to affect the taste. Take it home, remove the chicken from the skin and bones, cube and toss into a container. Leave in the fridge for a couple of days until you are ready to make this salad or even pop the cubed chicken in the freezer for up to a month. Then, mix and serve. Major buffalo happiness awaits. Make sure to use Frank’s Original Red Hot Sauce NOT the Buffalo Sauce or Wing Sauce (they have a bunch of nasty additives in them). If you can’t find it in your grocery store, you can use Crystal Hot Sauce but add a pinch of garlic powder to it. DO NOT use Tabasco. It is a totally different flavor and not meant for Buffalo Sauce. If you don’t want to make homemade mayo, Primal Kitchen and Sir Kensington’s are good alternatives. The PK is Whole30 compliant as well! Remove chicken meat from bones. Cube into 1" pieces. Toss with celery, mayo and hot sauce. Chill until ready to eat and Enjoy! I love using lettuce cups! I find it brings out so much more flavor when you use them! One of my weekly staples when it’s warm out! My kind of chicken salad! This buffalo chicken salad looks amazing!! Yummy, buffalo is the best! I made this for a company potluck today. I must say I wish I had a hand blender. The homemade mayo just didn’t emulsify in a regular blender. Came out too oily. I had to drain some and go grab some store bought olive oil mayo. 🙂 Turned out really good after I fixed it up though! Ha! Rechael – that sounds super time consuming. My mom used to feel very similarly about homemade mayo and stand there with a whisk for 10 to 15 minutes. Hence the reason she never made her own and bought mayo from the store lol. Anyway – glad you liked the recipe! I hear you – I’ve made that mistake as well – not good! Has anyone ever made this with Vegenaise instead of the homemade mayo? My husband is avoiding eggs because of cholesterol. Hi Julie! That should work fine. Vegenaise is a bit sweeter than regular mayo so you may need to adjust the seasonings a bit. I made it with Vegenaise and added more Frank’s to taste. I also chopped a green onion and threw that in. I served with crumbled blue cheese on the side. Thanks for an easy and delicious recipe! Sounds awesome Julie – glad it worked for you! I would save the skin and bones in the fridge until I get a bag full and then use them to make my own chicken stock. Boil them and then strain out the solids, put the broth in the fridge and when cold, remove the fat that has risen to the top. When you go to use the broth, add whatever veg’s you want for flavoring. That skin and bones are too good to waste and can be used further. You may even want to roast the skin and bones for a bit to make a more flavorful broth. Just my suggestion to make those rotisserie chickens go further for the cost. I CAN NOT WAIT TO MAKE THIS. I GET MY ROASTED CHICKENS AT COSTCO. THEY ARE THE BEST, PLUMPEST, AND ONLY $4.99. Yummy! This is one flavorful salad! The chicken looks so tender. And the flavors are bursting. And it is very easy to make. Great salad here! YUM! I have a chicken in the fridge and I’m going to make this tonight for dinner! Featured on Instagram and FB – getting ready to feature on twitter. Thanks for submitting! Sure wish I had a Whole Foods near me. 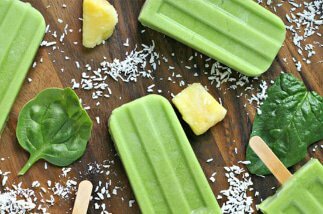 Looks delicious and so easy. You can use any chicken Norma – doesn’t have to be from Whole Foods! Love this recipe. So easy and delicious and perfect for a picnic. Pinning away! Can I use less Sriracha sauce? Thank you, Jo love your recipes. I am so making this, Whole Foods is next door. Frank’s is my go-to for all things Buffalo. It’s the bomb!